First, to check the reducer and the lubrication parts of lubricating oil can meet the demand. Second, to check the power voltage, additional voltage is 380 volts, negligence of ± 10%. Third, to check the wiring between motor and electrical components is not strong. Neutral wire should be connected to the power distribution box terminal block N, and all lines should be properly placed to prevent crushing. Fourth, when start mixing motor a stirring electric, two half shaft rotation direction should be the same as that of panels indicate, if the direction is wrong, should change the power supply wiring. Fifth, when you start the motor lifting hopper, hopper raising to discharge position should be automatically stopped and the doors automatically open. Sixth, began to discharge, discharge door open and close should be accurate in place.With water pump lifting water, water supply system should be normal operation. Seventh, the ratio determined by the desired concrete water supply, and adjust the water supply time to the corresponding relay. Initiate stirring motor operation. 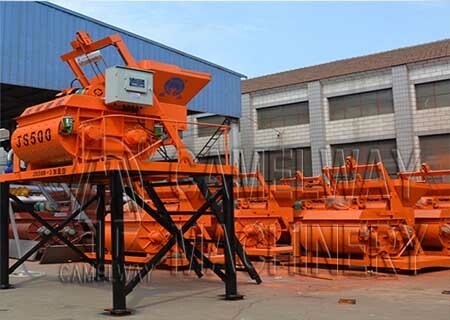 Eight, close discharge gate, and put the desired mixture into the hopper, then lifting hopper. Ninth, when hopper elevators is normal and reliable braking, put aggregate and water into the feeding tube. After stirring for 25-35 seconds, to initiate discharge door unloading.